Dragon Ball: Episode of Bardock is a short story written and illustrated by Naho Oishi, later adapted into an OVA by Toei Animation. Is a sequel to Dragon Ball Z: Bardock  The Father of Goku, based on the What If? scenarios of Dragon Ball Heroes. it's revealed that Bardock survived being killed by Frieza and was somehow whisked away to the distant past. There, he finds himself in primitive Planet Plant, where the locals are being attacked by the forces of Frieza's ancestor, Lord Chilled. Bardock befriends one of the locals, and will defend them out of revenge against Frieza. 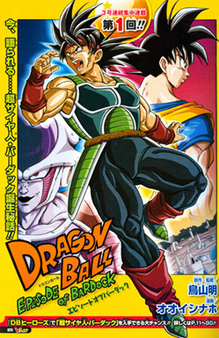 The movie is mostly known for Bardock obtaining the Super Saiyan transformation. The movie is not considered canonical in any way to the series, being merely a What If? story. Despite this, Bardock's appearance in Dragon Ball Fighter Z takes a lot of cues from this film, and Dragon Ball Xenoverse take a few ideas from this film. For the (rather scathing) Dragon Ball Z Abridged version of this movie, see here. Adaptational Heroism: Bardock was a cold-hearted Saiyan in Father of Goku, whose Establishing Character Moment was destroying a planet alongside his comrades as a giant ape, and having a feud against Frieza was out of revenge for the death of his comrades. By all intents, an Anti-Hero. Here, he protects the locals from Chilled, and even befriends one of them. Adapted Out: Mira and Towa from Dragon Ball Online saved Bardock from being killed off, yet they aren't adapted in this What If? story. Advertised Extra: This is one of the few animated specials where despite appearing on the advertising, Goku doesn't appear at all, not even as a cameo. Continuity Snarl: The movie attempts to be a What If? that explains where the Super Saiyan legend came from. Unfortunately, this directly conflicts with the pre Super canon of the series, where it was mentioned that the first Super Saiyan became one when transforming into a Great Ape. Forgot About His Powers: Bardock's psychic powers from the last movie simply vanished, and are never mentioned. Golden Super Mode: Bardock turns Super Saiyan over his weakness against Chilled. He then proceeds to beat the living crap out of him. Revenge by Proxy: Bardock takes all of his anger on Chilled due to him being like Frieza. Can't blame him, Chilled is basically Frieza, but smaller and wearing a leotard. Remember the New Guy? : Apparently there was a third race of aliens living on the planet Plant. Riddle for the Ages: How Bardock went back in time is anyone's guess. In videogames, he was saved by members of the Demon Realm and brainwashed, but that's two different continuities. Tranquil Fury: After he transforms into a Super Saiyan, Bardock manages to catch his temper and proceeds to deliberately, calmly, and mercilessly beat Chilled half to death and blast him into orbit. Chilled does not survive the encounter. Unstoppable Rage: In the Spinoff detailing how he became Super Saiyan, he gets pissed after a little native boy on Planet Plant was nearly killed by Chilled. It's this that kickstarts his Super Saiyan transformation. Walking the Earth: After defeating Chilled, Bardock is seen walking through the wasteland.